Well here is the Joy sign we made as part of Christmas Craft Day.....simple to make and together with the Pine cone Skier this was the most popular craft of the day. piece of corrugated cardboard 5"x15"
Cut your cardboard to size...I precut all 120 signs before craft day. Cut out your JOY letters using the red and white wrapping paper. At school I used the die cut machine to precut all the letters but you can use my template if you wish. 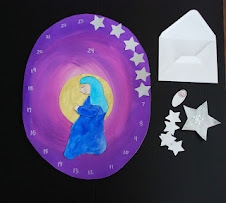 Using white acrylic paint or gesso paint the cardboard white. Add a coat of Mod Podge and then lay out your letters on top. Add a top coat of podge. The kids had a great time doing this and we only had a few "YOJ"s from the Grade Ones. While the podge is still wet you can add your sequins. You can use tacky glue as well to ensure the sequins stay on. The kids went thru thousands of sequins and in the end we were using leftover multicolored ones to add that sparkle. Using a knitting needle punch 2 holes for the hanger. Wrap a piece of wire (22 inches) around a pencil...stretch it out a bit and then tie into your holes. Add a silver bow and let dry. As you can see it was a great time on Friday....120 kids ...12 crafts...30 plus Moms,Dads, and Grandmas. Thanks everyone for coming out and making our Craft Day a huge success!!! 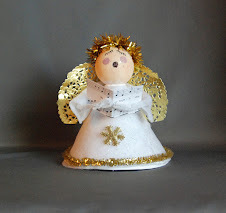 I also wanted to show Grade 4's Christmas Clay project...Angel plates. We used acrylic paint and glitter glue for highlights. I just finished sealing them with 2 coats of Duraclear yesterday. If I find some time I'll try to post the last few crafts from Christmas Craft Day...if not I want to take this chance to wish everyone a fantastic Holiday and I'll see you soon with lots more projects from you know "that artist woman"
I just love those plates!!!! 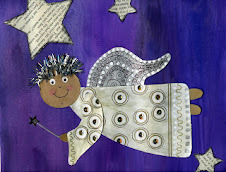 The angel plates are delightful; your craft day looks like tremendous fun--what wonderful memories for the kids. And I'm going to make myself a JOY sign--maybe more than one: just looking at the word makes me happy! Thank you for the idea ... And Happy Holidays. I have recently discovered your fabulous blog (I believe it was through the blog titled: The Adventures of Bear) and am so excited that I did. I have already spent several hours with a cuppa, browsing through your projects. So much goondess here! Thank you for sharing such a wonderful range of inspirational ideas. I look forward to visiting regularly. But I wanted to let you know that I have nominated you for a blog award today. I love your blog and all the wonderful tutorials you have posted :) You have quite a collection! I really love all your projects! I visit frequently looking for new ideas to engage me & my boys for homeschool art. 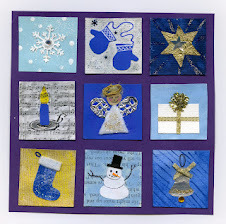 We are gearing up to do several of your Craft Day Christmas projects and I'm wondering if it is ok to link to your posts? Thanks for sharing your creativity and inspiring us! I am thrilled you are enjoying the blog and you most certainly can link to me.